Ah, talk about an eternal question. I kid, but as with anything buying a new shower head can take hours of research and painstaking sifting through hundreds (or even thousands!) of seemingly identical products. Thankfully, you have me to save you all that time and effort. 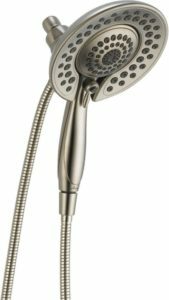 Today I’m going to go over my thought process for picking the right shower head, out of multiple different types and brands, and then show you a bunch of my favorites. I generally dislike combos. My issue is that the second head usually either gets in the way, doesn’t work very well, or both. The Delta In2ition (funnily, the only thing I hate about this one is the lame name) neatly solves that issue by embedding the handheld portion of the combo INSIDE the fixed portion, letting you detach and use it at will, use it as an extra large head when embedded, or taking it apart and using the handheld portion without having the nice, soothing water on your head shut off. Besides the unique design, it has its fundamentals down pat as well. 2.5 GPM, a 6 foot hose and a host of settings. Well, a host of massage settings: it has four different massage settings (slow, fast, pulse, and combination) plus its normal spray; it doesn’t have a jet or bubbler or anything like that. What it DOES have is an excellent feature more of its peers should have: a pause function. By just tapping a button you can cut the flow to the it without actually turning your faucet off, keeping the water warm for when you turn it back on. This is perfect for if you need to get out of the shower in the middle or (especially) for shaving if you need to shave your legs or if you’re like me and enjoy shaving your face while in the shower to save a bit of time. It will cost you not much under $300, but for what you get the price is WELL worth it. It has five massage settings, what else needs to be said? This is my favorite on this list in general, and it’s a good massager. A no-brainer for this spot, in other words. While expensive (at over $300) it’s a high quality combo (already a rare thing) with five massage settings and a pause function (one of my favorites) that looks nice, and is constructed well. Not much else to say: it’s one of the popular products on the market, my personal favorite, and a great massaging tool to boot. Grohe takes the top spot here. This brand overall is one that produces consistently high quality products in every category. While not the top of every kind, they produce very good options for any type you’d care to buy, mostly through a combination of style and technology. It’s hard to make a handheld shower head look good, but Grohe almost (…almost) manages it with the Movario Five’s nice bronze look. More than the looks though, its Dream Spray technology gives it a leg up over the competition (as does the same technology do for a lot of Grohe’s other products). Dream Spray simply makes sure all the water coming through your pipes and into the head disperses equally to each of the nozzles. It may not sound like much at first, but think back to your experience with some cheaper products, where changing a setting often means dealing with the annoyance that some of the holes around the bottom or edge only produce a trickle, or spray off in some random direction instead of straight out or down. The technology backs up five distinct settings: a normal full spray from all holes, a powerful jet from the center, a massage setting, a gentle rainfall like setting, and “Champagne” (large, air enriched bubbles that just feel nice to have the option of). When mounted it can be set firmly to eight different positions so you can even use it as a fixed head if you like, something a lot of handhelds struggle with (many lower quality ones often being jogged from their mounts once the water starts running, or they simply lock to one position and can’t be adjusted). For the price (under $200), you can’t beat the Movario Five in the handheld arena, and it even puts a lot of fixed options to shame. The closest you can get to showering under an actual rain cloud in your home. As previously mentioned, Grohe is an exceptional brand, largely on its superior technology to many other brands. This rainfall-type product shares the same cool Dream Spray technology that ensures even distribution of water to each of the 120 easy to clean nozzles on its surface. 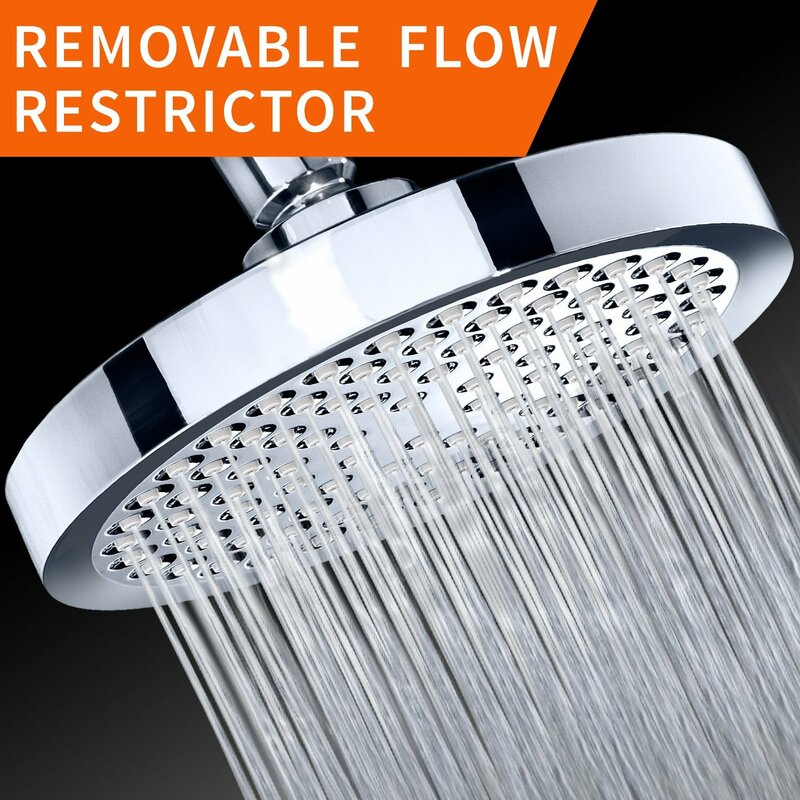 This is important for any shower, but extra important for a rainfall shower head, which has the entire dedicated purpose of providing an evenly saturated rain experience designed to be soothing and natural feeling. 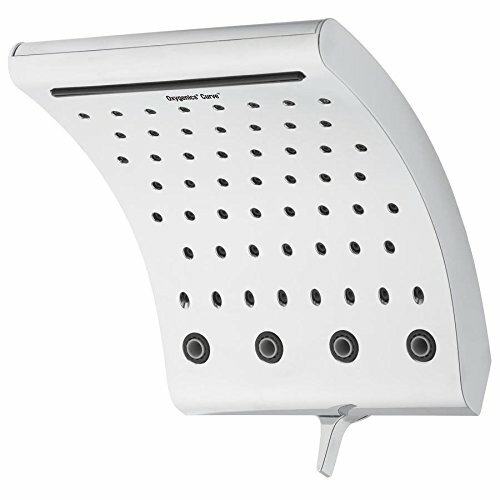 In addition to that, this has two other Grohe technologies: Drop Stop to prevent the it from dripping after the water is turned off, and Starlight, an extra strong and scratch resistant finish (three times stronger than the industry average) guaranteed to keep this looking fresh and new for as long as currently possible. While this pleasure will run you over $500, it’s well worth it for those who need the perfect product at any price, and since its only downside is a lack of a maximum flow option (it caps out at 2 GPM), which is expected from a rainfall product anyway, there’s nothing else you really need to compensate for. A fun novelty that still provides a good shower once that novelty wears off. LED shower heads are pretty fun. I like their design, and they manage to meld function and aesthetic together very well, both serving each other. The LEDs themselves are powered by an internal dynamo (no batteries needed) that are spun as water flows through, creating a self powering machine. The lights change color depending on temperature: blue if the water is still cool (under 95 degrees), green if it’s warm (95 to 108 degrees), red if it’s hot (109 degrees to 122), and it will flash a bright red warning if the temperature is hotter than that. At a base level, this is convenient. It means you don’t need to put your hand under the water every few seconds to test whether it will feel nice to get in, and it makes it easier to make adjustments to the temperature before you ever step foot inside, since sometimes your hot water will come out hotter than others (just today I scorched myself a little because the water came out about 10 degrees hotter than usual). 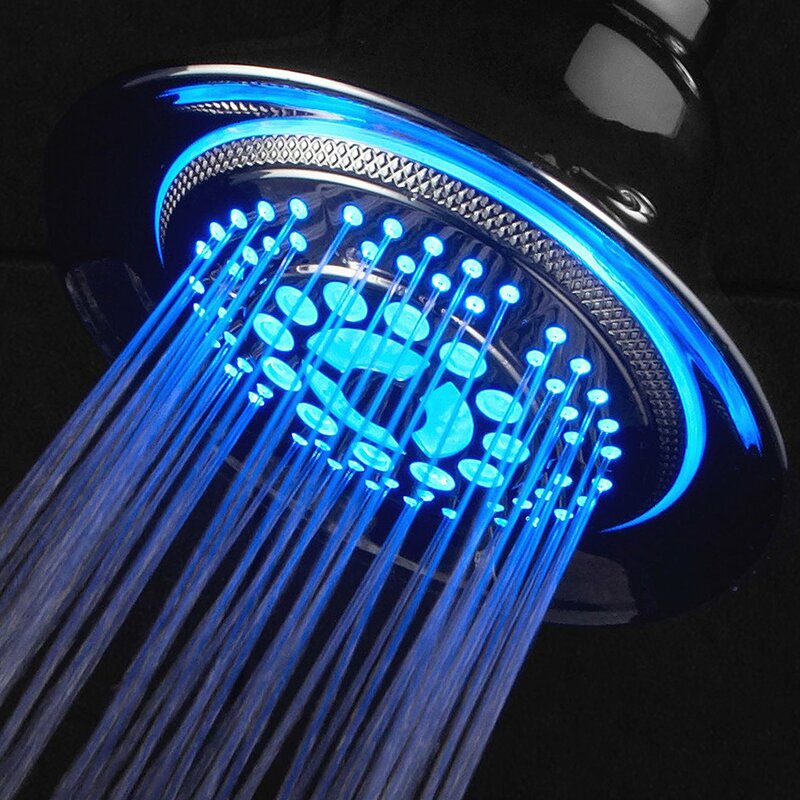 It also lets you take a shower in the dark, sort of, but I imagine that would get old quick (though very nice for someone who has a hard time handling bright lights in the morning). I think one of the overlooked uses though, besides convenience, is letting the kids more easily tune their own showers without burning themselves. It’s not a perfect system, but it will at least let the kids know not to get in if it’s red or hotter. For under $40, this isn’t bad at all. Besides the LEDs it has solid chrome construction, a wide 5.25 inch face, and five settings (rain, water saver, massage, mist, and one of my favorites: pause), so even when the LEDs are just a luxury you don’t need to feel bad: you have a good quality product as well. The right one to choose for pure pressure, though average in other respects. This is a stainless steel “rainfall” (more of a faux rainfall, it’s still angled and fires jets of water rather than letting it fall more naturally) head with touch clean nozzles that is resistant to calcium and lime build up. As far as basic stats go, nothing to write home about, though it’s just fine for the price (between $20 and $40). The real kicker here is its GPM: the max legal 2.5 GPM with the flow restrictor and a whopping 7.62 GPM when you remove it (and the manufacturer makes it very easy to do so). For people who really feel the need to take a pressure washer to themselves in the shower, this thing is perfect, being able to hit everything from a trickle to an uncomfortably fierce blast depending on how high you turn your bath knob. You can get a satisfying shower with this. One of the main issues with an RV is that the water pressure is usually low, since the tanks are usually tiny. But with how often you have access to full hook ups nowadays in an RV, why not get yourself the optimum shower head brand fthat can provide a nice shower? That’s what this is designed to do: turn your low flow into high pressure with a 3 inch wide product made of sturdy materials and three (well, two: normal, massage, plus a mix of the two) settings to choose from. It’s not the greatest around, but it is the perfect for this purpose, and at only a little over $20, why not give it a shot? You can always go back to the one your RV came with if it doesn’t work out, or you’re stuck somewhere without a full water supply. I can see a few uses for a product like this, but honestly not many. For a home that already has a low water flow, I can see this being of use. You get a more directed stream with a slightly higher pressure. 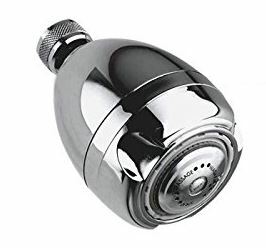 Other than that, while it’s a pretty well constructed option (made of corrosion resistant ABS plastic, with three settings: full, jet, and massage options), most other uses people claim it for seem hardly worth the massive loss in actual function of the shower. I’ll admit perhaps my bias is clearly showing here: I prefer high pressure, high heat in my showers and aim to be coated in water the whole time, so having a low flow (purposefully restricting an already greater flow) seems counterproductive to me. Money saving claims sound nice on paper, but don’t add up to any great amount on a yearly basis in most cases. Still, that’s nothing against this one in particular: it has a purpose, it fulfills it well (the stream is nicely focused so an adequate shower can be had from it in some cases…though people with long or thick hair naturally report difficulty getting clean using it), and it will cost you less than $10 up front. If you need a replacement product for a home with low water pressure, or want to give water saving a try, it won’t cost you much. The most unique rainfall design I’ve seen. The design is the real standout feature of this shower head. It’s curved and makes an extension arm unnecessary: it projects the water better from each of its three settings. 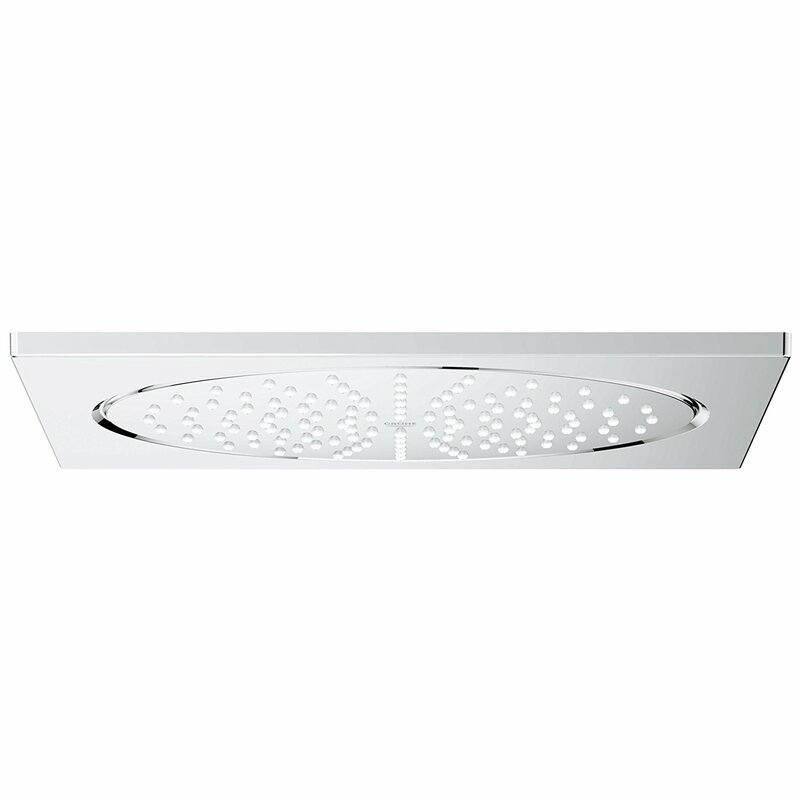 It has a standard shower setting using those center holes, the “Multi Oxygenics” spray using only the bottom holes (picture), and a waterfall mode using the top bar that emits a sheet of water. Less settings than many other of its competitors, true, but all of these are unique, and the waterfall mode is something nobody else does. One thing to keep in mind: it requires a high water flow, if you have low flow in your home steer clear of this one. Other than that, it’s a great deal for the under $100 price tag. Big bonus points for style. As for the quality itself, this is on the middle to high end. It has a great 2.5 GPM output and four settings (standard full blast, a massage setting, a “vigorous” setting, and a combination of the full shower and massage settings). The construction is pretty solid, non-metallic (and therefore rust and corrosion resistant). But really, it mostly edges out Moen’s other options by the fact it looks really nice. They have others that meet it in value and function, but this one just looks excellent in my opinion. Kind of like you’re showering with the water from a bell. 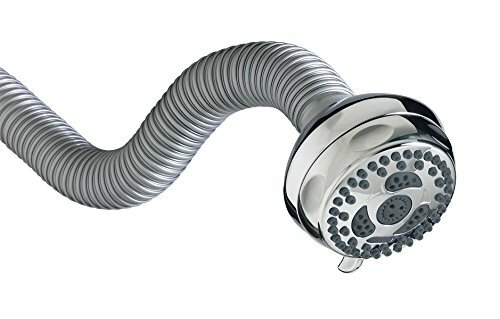 It will run you a bit under $150, but that’s not a bad price at all for a stylish, functional shower head. Another unique and interesting design. The cool feature here is the flexible 18 inch head. You just put the hose to whatever position you want and it stays there, perfect for cleaning the shower or accommodating people of different heights and preferences. If it were just that gimmick that was holding it up though, it wouldn’t be here. In addition to its cool, unique feature it’s also a pretty solid tool in other ways, spraying 2.5 GPM out of its relatively small 3.5 inch surface. The rubber nozzles are easy to clean and relatively resistant to accumulating grime. For under $50, it’s hard to do better for a family-friendly option that can accommodate both the little kids and adults in the house (great for single bathroom homes or apartments). Just the idea of a scalp massage from this particular product already has me relaxed. As a pure rainfall product, this one is kind of a failure. Rainfall designs should be arranged directly above the head and fall straight down; this is a faux rainfall product. 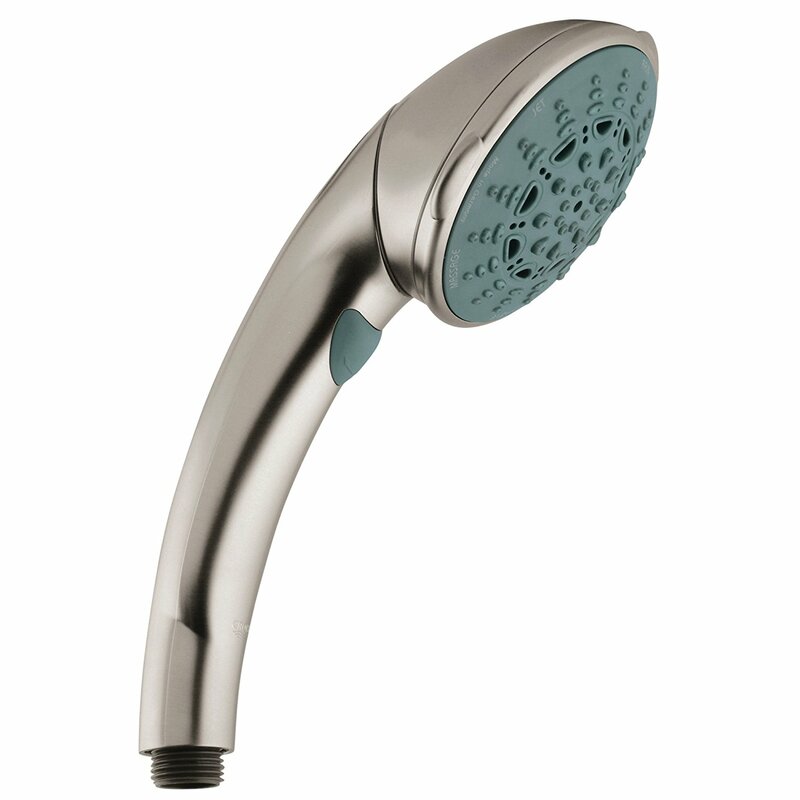 But as a shower head in general, this thing is really cool. It has all the basics you’d expect: stainless steel construction, touch clean nozzles, a chrome finish, and a limited lifetime warranty. The real centerpiece here though is those jets in each of the three heads which can be turned on and rotated separately from each other, allowing the water to hit several places at once for a more thorough, relaxing massage. Each of the three settings (drenching rain, power massage, and a combo of the two) can be controlled with one hand instead of a cumbersome inner dial or sticky knob around the edge. Considering you can get this sucker for under $20, it’s probably the ultimate cheap product on the market today, having a unique design with some luxury functions fit in without a jacked up price point. Solidly made and highly adjustable. Solid brass construction is one of the main draws of this one. 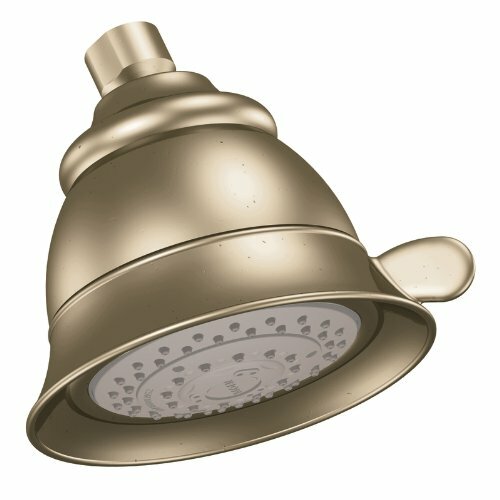 It makes it a very sturdy, incredibly long lasting product (there’s a reason old homes often have the same fixtures in their bathroom as when the house was built generations before), though is a bit of a double edged sword: unlike modern ones (often made of stainless steel or plastic), brass products require careful attention. While brass does not rust like iron, and the bronze portion of the alloy is safe from corrosion as well, without proper cleaning and care the zinc components can rust, leaving your shower looking largely fine on the outside…but leaving space for the head to brittle and become prone to cracking or crumbling. Still, brass is a very fine material as long as you keep that in mind, and the rest of it keeps to the same theme of being very high quality, but needing a bit more adjustment than you may be used to. While it only has six nozzles, it has 48 different combinations of strength and power available from those, all controlled with the knob on the side. 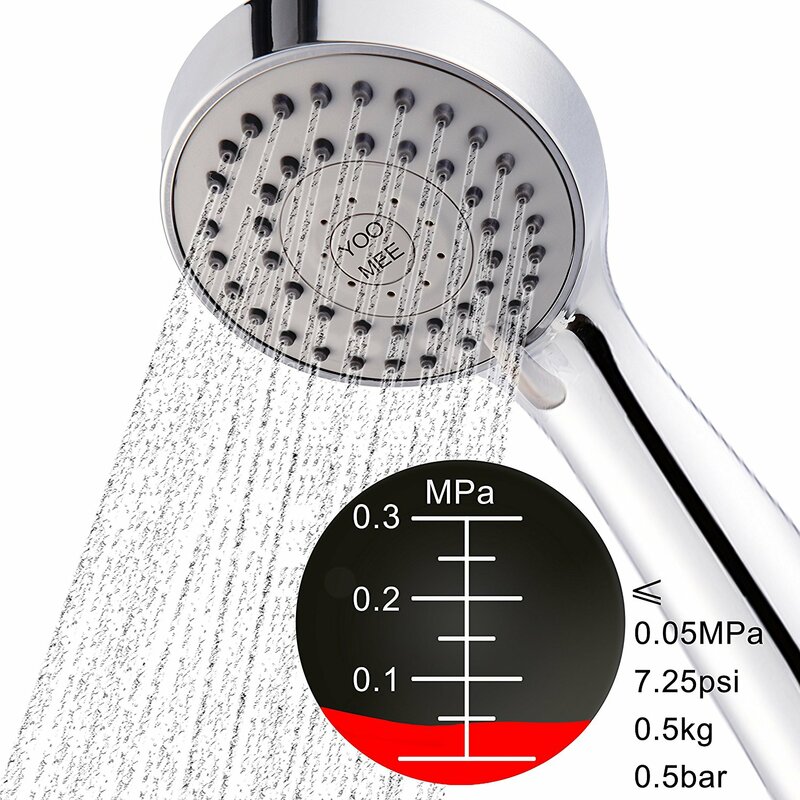 While it may take some fiddling to get it like you like it, it has far more variability than most of the others around, so if you’re willing to take the time to tune it to your perfect liking, this can be the optimal shower head you’ll ever buy (though would probably be as infuriating to share as a car in some of the same respects; I imagine you’d get as annoyed by someone changing your shower settings as messing with your mirrors and seat adjustments). It will cost you over $100, but a limited lifetime warranty (which means something with a brass fixture, keep in mind) backing up this already great buy takes the bite out of that immediately. Just beats out Moen’s offering for most stylish product we’ll look at today. Let’s give the Delta In2ition a break and look at one of Delta’s other quality offerings for this slot. Call this the runner-up for Delta’s best. This one comes in a variety of colors (Chrome, Polished Brass, a combination of the two, Aged Pewter, Champagne Bronze, Brass, and Stainless to be specific), but the Venetian Bronze is the great-looking one for me, taking into account how my own bathroom looks. The rest is down to personal preference and what matches the rest of your design, but they’re all nice. 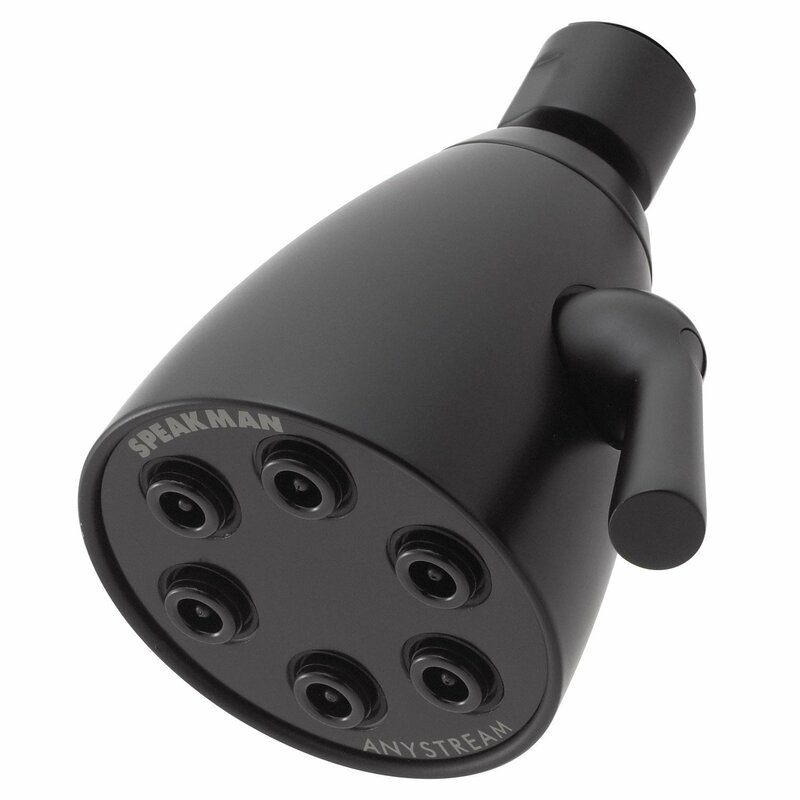 But this shower head isn’t just a pretty face: it hits 2.5 GPM, has rubber touch clean spray holes (colored such that they fit perfectly with whatever color and style you choose), and three spray settings (full body spray, massage, and a drenching spray), making it have enough function to justify buying it for its form. The price is nothing to complain about either, running you under $100 it outperforms several options in the same price range and doing it with panache. If you like interior decorating (and a more old school, somewhat antique look fits your bathroom’s style), give this one a look. There are a lot of great options out there. Grohe steals the show a bit by having two of the best (the Movario Five for handhelds and the Rainshower for rainfalls), but our ultimate winner is Delta, with the In2ition, being the top overall product in everything but name. I would have put it in the top handheld slot too, but I figured it was overkill; the Movario Five has enough advantages (and a price gap, making it the right one for the money in that category) over it that I didn’t feel comfortable putting it on here twice. Plenty of others on this list are great, mind you, but the only one I wouldn’t recommend for most people is the Niagara, which again admittedly is probably due to my bias against low flow showers, but other than that you can’t go wrong picking up any of these for your bathroom, no matter your budget. Choosing the one comes down to a lot of details. It essentially boils down to just a few things: what kind do you want, what style looks good, how good is the construction, and what’s your budget? There are three main types: traditional, rainfall, and handheld. Traditional ones are round, with a bunch of small holes, usually shooting the water out at a relatively high pressure (2 to 2.5 GPM – Gallons Per Minute). These are what you see whenever you stay at a hotel, or move into a new home (usually), and are the most common type. Rainfall ones hang directly above you and drop the water straight down. They are usually square or rectangular, or rarely round (though always large circles). 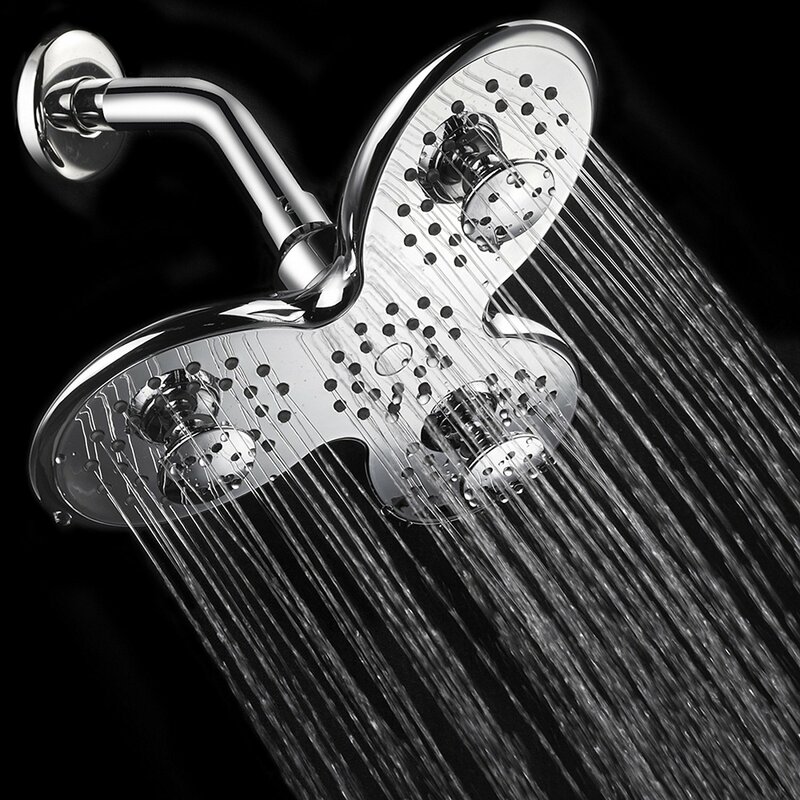 They have a much larger number of holes compared to any other type of shower head. Their purpose is to drop water down to simulate, as the name implies, natural rainfall, and drench your whole body at the same time. Relatively rare, but popular among a lot of people. Handheld ones are attached to a hose, have a handle, and can be maneuvered around. While they can be used like a fixed head as well, they are at their game when used to “spot wet” parts of you, and are often used for their massage function more than anything else (and are perfect for washing hair and massaging the scalp!). Besides those there are several types of dual or combo (a mixture of a handheld and fixed heads) or those that are similar to the more traditional types, but with higher or lower pressure and flow. Style varies widely from type to type, and is constrained by what basic typeit is. Traditional ones are almost always going to be cone or bell shaped (with some having thinner, watering can like heads), while rainfall often have very thin rectangles, squares, or rarely circles. The most common type of finish is chrome, though you can get a variety of nice colors and finishes if you’re willing to pay a bit extra. It really comes down to what type of color or style fits your bathroom; a bright chrome might go well in a brighter bathroom with tile, but may stand out in a bathroom mostly accented with dark woods or tile. 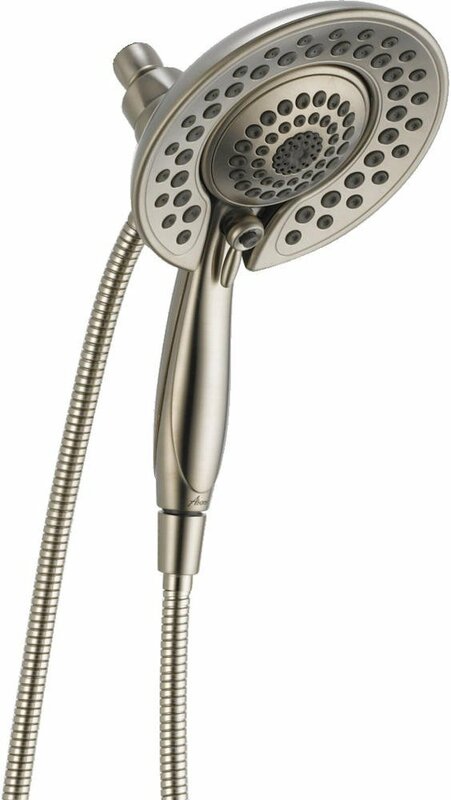 At its most basic, a shower head will be made of aluminum or stainless steel with a chrome finish, or plastic. There are levels of quality within all of these, but stainless steel and ABS plastic respectively are usually the right choice. The nozzles are usually made of plastic or rubber (the rubber is easier to clean), though sometimes silicone is used for the higher end ones (rainfall in particular). When looking at finishes, prioritize durability over most else; it doesn’t matter how nice a finish looks at first if its scratches, scuffs, warps, or discolors after a while. 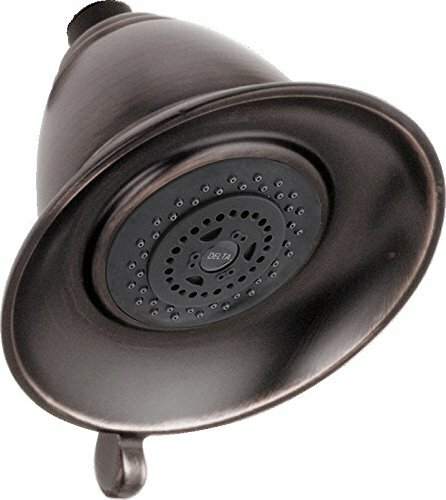 Shower heads can range anywhere from under $20 to over $500 on average. At the extreme ends you can halve or double either end of that range, but we’re mostly sticking within it today. While a $300 price tag may give you sticker shock at first, keep in mind that most options are made to last a long time, and often have lifetime warranties as well. This is a fixture you’re likely to keep the entire time you’re in a home unless some unexpected breakage occurs. Breakages are easier and more common with cheaper products, that tend to be prone to corroding or leaking sooner than more expensive ones made of better materials. A more expensive option will therefore likely cost you more up front, but pay for itself in the long term both in terms of how much longer it will last than a cheaper one and the better function you’ll get over that lifespan. This is the type of fixture similar to appliances and mattresses: you only want to skimp if you absolutely can’t afford better, or if you know it’s going to be a temporarily used item.